October. My favorite month of the year. Summer flowers linger as foliage changes and tree fruit ripens. The air seems to ripen along with the apples into sweet, golden days perfect for long walks. Then come the rains that freshen the earth and make my heart turn inside to candle and fire light, cozy wraps and another blanket on the bed. October. Nights are cooler and warming scents and food welcome. 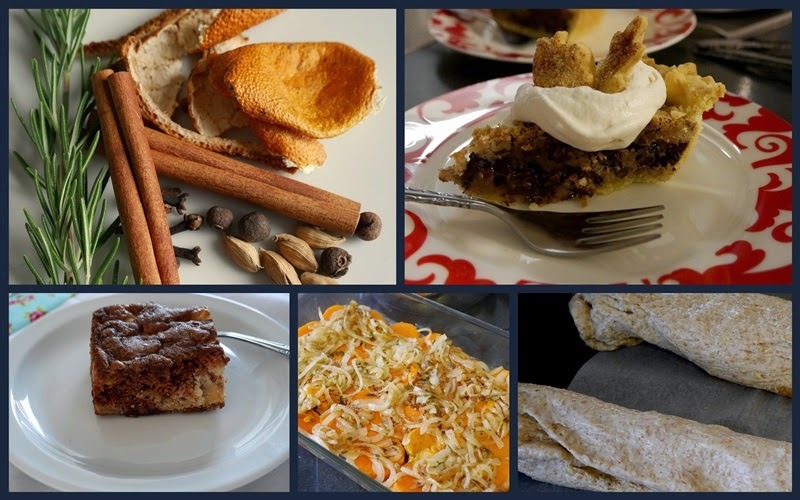 Apple cake, fresh bread rising, cinnamon and orange simmering on the stove. Hearty soups and all those delicious squashes. Thanksgiving dinner. Loved ones gathered round. Thanks be to God. October. 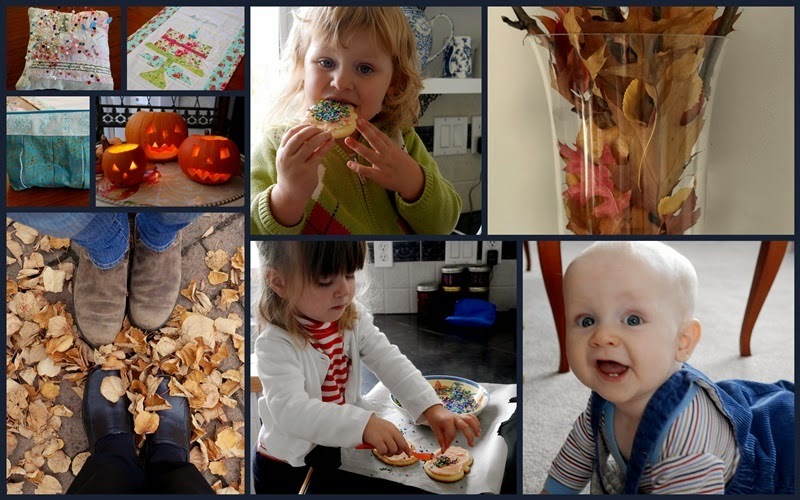 Glowing pumpkins, rustling leaves, children laughing. Baking cookies with two little girls, encouraging a little man as he begins to explore his world. A bit of sewing, reading, gardening. October flaps its wings and lifts off. Whoosh. Away. Beautiful days are now a memory. Thank you for the evocative descriptions of the pleasures of the season. I read this with2 minutes left in my favorite month. It has been unusually warm for October this year. I rather miss the "crisp" but cold will be arriving later. Your grands are adorable. Is there a chance of snow frolics with them soon? Lovely photos and texts... Thank you, Lorrie! 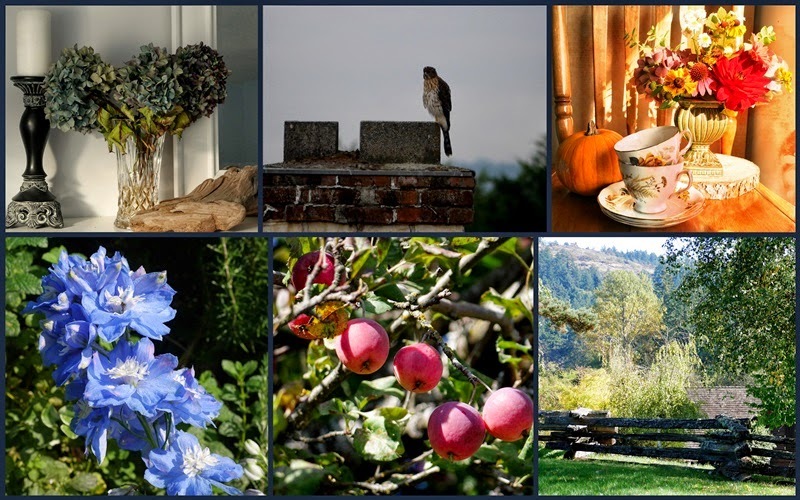 Your photos tell of happy family gatherings, yummy food and the fruits of Autumn. It's 1st November here - All Saints Day. October is such a month of change. Yours looks filled with many delightful things. On to some colder weather now? November has hit us with a wintry blast. What a lovely post. Nicely written and presented. I love the fair-well photo to October. For us, November is Thanksgiving at the end of the month. Weather has been warm and dry, with a change expected. Snow predicted for Denver, 60 miles south of us, so who knows what we will receive. The trees are nearly bare. Wishing you a wonderful weekend. I can smell the wonderful Octoberness of your house!! Makes me feel warm and cozy! It was certainly a beautiful month in your world...a month full of the richest of blessings! Sweet faces in your collages! Happy (belated) birthday to you! You had a grand month! October is always a special one. What a charming post - I enjoyed all the photo collages. Beautiful gathering of October for sure! Your grands are so cute...the wonderful dreamy-eyed look of your blondie as she munches a delicious cookie...the serious concentration of your brunette adding the right amount of sprinkles...the high delight of a wee charmer...pretty sure that they'll make November special, too. It was a lovely, lovely October! Thankful for the beautiful memories and I know you, as well as I, will keep them to remember during the long cold months ahead! A lovely review of October and then in a twinkle of the eye, swoosh away! I like that. Beautiful! A love your monthly recaps, Lorrie. Your pictures are so worth a thousand words - so much joy and beauty pour from them and all are bound with love. Thanks so much for sharing them! Great snaps. It's so true that time flies by so quickly. Well your photographs are certainly a good advert for Autumn.